Just like other cultures throughout the middle ages, Viking helmets could vary in style. This Furdess Helmet, for instance, is a variation of the typical Viking helm that trades in an open design and mail drapes in favor of greater facial protection. Even without any intimidating spikes, though, this helmet is still definitely rich in the intimidating look of Viking armor. This helmet is similar in design to a typical Norman helmet, featuring a rounded crown with a central ridge that has been reinforced along the helms transverse. The helm does come to a subtle point atop the crown, which serves to help divert blows down along the side of the helm, instead of letting them strike squarely atop the head. Instead of a simple nose guard, though, this helmet features an impressive looking full-face mask with half-circle eye-holes, as well as several small breathing holes across the bottom of the mask. The sides of the helmet also feature hinged protectors that hang over the ears and the sides of the head, for added benefit, although most of the helms protective features are focused towards the front. This helmet is made from 14 gauge steel, making it quite tough and rugged. It comes with a chin strap and leather interior padding, for added effectiveness. 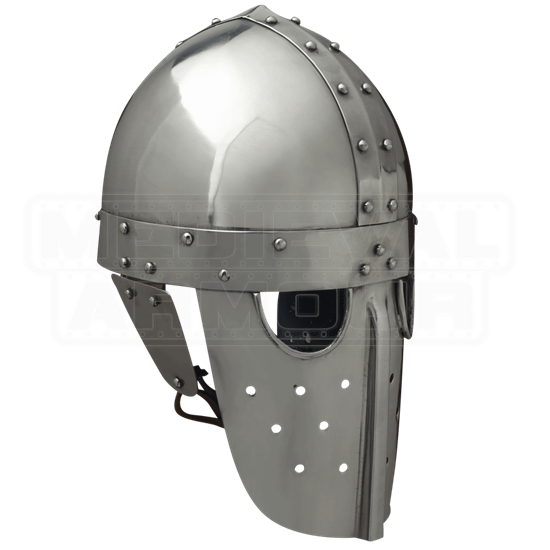 One might look at the Furdess Helmet and its forward-oriented defense and see that it possibly represents an age-old mentality among the most brutal of warriors, best summed up in the creed of never leave behind you a man, woman or child who could ever wield a sword against you.